Judas Priest formed in 1969 in industrial West Bromwich, in the Black Country, by vocalist Al Atkins and bassist Brian "Bruno" Stapenhill, with John Perry on guitar and John "Fezza" Partridge on drums. Perry soon died in a road accident, and amongst the replacements the band auditioned were future Judas Priest guitarist Kenny "K. K." Downing; at the time, they turned him down in favour of 17-year-old multi-instrumentalist Ernest Chataway, who had played with Birmingham band Black Sabbath when they were still called Earth. Stapenhill came up with the name Judas Priest from Bob Dylan's song "The Ballad of Frankie Lee and Judas Priest" on the album John Wesley Harding. No member of that early line-up lasted long enough to play on the band's recordings, though several songs co-written by Atkins appeared on their first two albums. The band gained a three-album recording contract with the label Immediate in late 1969 after a gig in Walsall,[a] but the label went out of business before an album could be recorded, and the band split in 1970. Late in the year, Atkins found a heavy rock band rehearsing without a singer called Freight, made up of K. K. Downing on guitar, his childhood friend Ian "Skull" Hill on bass, and drummer John Ellis. He joined them, and they took on Atkins' defunct band's name. Their first gig was on 6 March 1971. Ellis quit later that year and was replaced with Alan Moore. Early shows included Hendrix and Quatermass covers, and in 1972 the set list included the originals "Never Satisfied", "Winter", and the show-closer "Caviar and Meths". Moore left and was replaced with Christopher Louis "Congo" Campbell, and the band joined Black Sabbath guitarist Tony Iommi's management agency Iommi Management Agency. [b] Atkins continued to write material for the band—including "Whiskey Woman", which became the base for the Judas Priest staple "Victim of Changes"—but as finances were tight and he had a family to support, he played his last gigs with the band in December 1972. Campbell left soon afterwards, and the band enlisted two members of the band Hiroshima: drummer John Hinch and vocalist Rob Halford, the brother of Hill's girlfriend. [c] Judas Priest made their first tour of continental Europe in early 1974 and returned to England that April to sign a recording deal with the label Gull. Gull suggested adding a fifth member to fill in the band's sound; they took on as a second lead guitarist Glenn Tipton, whose group The Flying Hat Band were also managed by Iommi's agency. A precursor of The Flying Hat Band called Shave'Em Dry featured future Starfighters drummer Barry Scrannage, who had played with original Priest members Ernest Chataway and Bruno Stapenhill in the band Bullion. Judas Priest went into the studio in June–July 1974 with Black Sabbath producer Rodger Bain. The band released their debut single "Rocka Rolla" that August and followed in September with an album of the same name. The album features a variety of styles—straight-up rock, heavy riffing, and progressive. The band performed "Rocka Rolla" on BBC Two's The Old Grey Whistle Test in 1975, as well as the "Dreamer Deceiver"–"Deceiver" pair the year before the songs appeared on Sad Wings of Destiny. Hinch left the band for reasons that are disputed and was replaced with Alan Moore, who returned to the band in October 1975. Finances were tight: band members restricted themselves to one meal a day—and several took on part-time work—while they recorded their follow-up album on a budget of £2000. The group intended to make an album mixing straight-ahead rock with a progressive edge. The band recorded Sad Wings of Destiny over two weeks in November and December 1975 at Rockfield Studios in Wales. The band stayed sober during the 12-hour recording sessions. The cover depicts a struggling, grounded angel surrounded by flames and wearing a devil's three-pronged cross, which became the band's symbol. The album was released in March 1976, with "The Ripper" as lead single. The band supported the album with a headlining tour of the UK from April to June 1976. By this time Halford joked that fans should burn their copies of Rocka Rolla. The album had little commercial success at first and had difficulty getting noticed due to critical competition from the rise of punk rock, though it peaked at No. 48 in the UK and had a positive review in Rolling Stone. Fans, critics, and the band have since come to see Sad Wings of Destiny as the album on which Judas Priest consolidated their sound and image. It features heavy riffing and complex song arrangements that Tipton and Downing have said were inspired by the factories of The Black Country. The album's centrepiece "Victim of Changes" evolved from a combination of Atkins' "Whiskey Woman" and Halford's "Red Light Woman", and went on to become a fan favourite. The band grew dissatisfied with Gull; the tight finances led Moore to leave the band a second time—this time permanently. Sad Wings of Destiny caught the attention of CBS Records, and with the help of new manager David Hemmings, the band signed with CBS and received a £7004600000000000000♠60000 budget for their next album. The signing required breaking their contract with Gull, resulting in the rights to the first two albums and all related recordings—including demos—becoming property of Gull. Gull periodically repackaged and re-released the material from these albums. Judas Priest recorded their major-label début in January 1977 at The Who's Ramport Studios, with Deep Purple bassist Roger Glover as producer. Moore left again during the sessions and was replaced with session drummer Simon Phillips. The album features significant developments in heavy metal technique, in particular its use of double-kick drumming on tracks such as "Dissident Aggressor", and includes a pop-metal cover of "Diamonds & Rust" by folk singer Joan Baez. Sin After Sin appeared in April 1977. It was the first Priest record under a major label, CBS, and the first of eleven consecutive albums to be certified Gold or higher by the RIAA. Phillips declined to become a permanent member of Judas Priest, so the band hired Les Binks on Glover's recommendation. Together, they recorded 1978's Stained Class, produced by Dennis MacKay, and Killing Machine (released in America as Hell Bent for Leather). Binks, credited with co-writing "Beyond the Realms of Death", now regarded as one of the band's classics, was an accomplished and technically skilled drummer and his addition added a dexterous edge to the band's sound. [original research?] Binks also played on Unleashed in the East (1979), which was recorded live in Japan during the Killing Machine tour. While the first three Judas Priest albums had considerable traces of Black Sabbath, Led Zeppelin, and Deep Purple in them, as well as ballads, Stained Class did not contain any ballads aside from "Beyond the Realms of Death". Killing Machine was the first nod to a more commercial sound, with simpler songs that brought back some blues influences. At about the same time, the band members adopted their now-famous "leather-and-studs" image. In May 1988, Ram It Down was released, featuring several reworked songs left over from Turbo, in addition to new songs. The band recorded three tracks with pop producers Stock-Aitken-Waterman: two originals, "Runaround" and "I Will Return", and a cover of The Stylistics' hit "You Are Everything"; however, they were ultimately not included on this album due to a management decision. A reviewer has called Ram It Down a "stylistic evolution" that resulted from the band's "attempt to rid themselves of the tech synthesiser approach ... and return to the traditional metal of their fading glory days". The reviewer argued the album showed "how far behind they were lagging ... the thrashers they helped influence" in earlier years. In 1989, longtime drummer Dave Holland left the band. In 1990, the band was involved in a civil action that alleged they were responsible for the self-inflicted gunshot wounds in 1985 of 20-year-old James Vance and 18-year-old Raymond Belknap in Sparks, Nevada, USA. On 23 December 1985, Vance and Belknap, after hours of drinking alcohol, smoking marijuana and allegedly listening to Judas Priest, went to a playground at a church in Sparks with a 12-gauge shotgun to end their lives. Belknap was the first to place the shotgun under his chin. He died instantly after pulling the trigger. Vance then shot himself but survived, suffering severe facial injuries. Following numerous complications, Vance too died in 1988, three years after the suicide pact. In a February 1998 interview on MTV, Halford came out as gay. A new studio album, Angel of Retribution, was released on 1 March 2005 (US) on Sony Music/Epic Records to critical and commercial success, earning the band a 2005 Metal Hammer Golden Gods Award for Best Album. A global tour in support of the album ensued. As for the band Halford, writing for the fourth release was cut off. After the Retribution tour in June 2006, however, Halford announced he would create his own record company, Metal God Entertainment, where he would release all his solo material under his own control. In November 2006 he remastered his back catalogue and released it exclusively through Apple's iTunes Store. Two new songs allegedly set for the fourth release, "Forgotten Generation" and "Drop Out", were released through iTunes as well. Along with Queen, Kiss and Def Leppard, Judas Priest was an inaugural inductee into the "VH1 Rock Honors". The ceremony took place 25 May 2006 in Las Vegas, Nevada, and first aired on 31 May. Their presentation was preceded by Godsmack performing a medley of "Electric Eye"/"Victim of Changes"/"Hell Bent for Leather." Judas Priest then played "Breaking the Law", "The Green Manalishi (With the Two Prong Crown)" and "You've Got Another Thing Comin'", before which Halford rode a Harley onstage. In May 2010, Halford said the band had been offered a star on the Hollywood Walk of Fame, but "we've just never been there when they wanted to do the ceremony." He also revealed that a Nostradamus tour was still being contemplated: "We were in Hollywood recently and met with some producers and agents, so there are a lot of things going on behind the scenes." Judas Priest announced on 7 December 2010, that their Epitaph World Tour would be the band's farewell tour and would run up until 2012. In a January 2011 interview, Rob Halford said about the band's impending retirement: "I think it's time, you know. 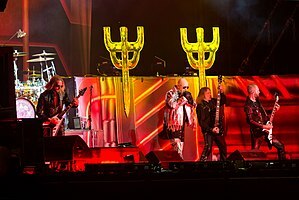 We're not the first band to say farewell, it's just the way everyone comes to at some point and we're gonna say a few more things early next year, so I think the main thing that we just want to ask everybody to consider is don't be sad about this, start celebrating and rejoicing over all the great things we've done in Judas Priest." On 27 January 2011, it was announced that Judas Priest was in the process of writing new material; the band also clarified their plans for the future, saying, "this is by no means the end of the band. In fact, we are presently writing new material, but we do intend this to be the last major world tour." Speaking at a press conference in Los Angeles on 26 May of the new material Glenn Tipton said: "It's quite a mixed bag. Really, there's more sentiment on this album. In a way, I suppose, it's also our farewell album, although it might not be our last one. There are some anthems on there, which pay tribute to our fans". In an August 2011 interview with Billboard, Halford explained that he and Tipton had "about 12 or 14 tracks completely mapped out" for a new studio album, with four of those tracks already recorded and mixed. The band made a point to take its time with the album, with Halford explaining "I'm of the attitude it'll be ready when it's ready ... I don't think we're going to slack off. We're determined to do a lot of work and be just as dedicated as we've always been and take a lot of care and attention with all the songs. We're not going to just bang this one out, so to speak." On 5 June 2013, Rob Halford confirmed that the Epitaph World Tour would not be the band's final tour. On 22 December, Judas Priest released a short Christmas message on their official website, which confirmed that they would be releasing their next album in 2014. On 17 March 2014 at the Ronnie James Dio Awards in Los Angeles, Rob Halford announced that the band's 17th studio album was finished. On 28 April, the band released the album's title track "Redeemer of Souls" for streaming on their official website. On 14 May 2014, the band's original guitarist Ernie Chataway died at the age of 62 from cancer, as reported by vocalist Al Atkins. Redeemer of Souls was released on 8 July 2014. It sold around 32,000 copies in the United States in its first week of release to land at position No. 6 on The Billboard 200 chart, the band's highest charting position in the US after the double-disc concept album, Nostradamus, debuted at No. 11. This was the band's first top 10 album in the US. The band went on tour in support of the album which ran from 1 October 2014 until 17 December 2015. The Redeemer of Souls Tour led to the sixth live album Battle Cry, which was released on 25 March 2016 after being recorded at the Wacken Open Air festival in Germany on 1 August 2015. In a November 2015 interview with Reverb.com, Richie Faulkner said that the band would start work on a new album in 2016. In April 2016, Loudwire posted a photo showing Rob Halford, Glenn Tipton and Faulkner himself in the studio beginning the process of the album, with Halford confirming in a radio interview that it would be ready by early 2017. During an interview at the 2016 edition of the Rock 'n' Roll Fantasy Camp, Halford expressed dissatisfaction on making an album similar to Redeemer of Souls. Faulkner then stated that the band would begin recording in January 2017 and also said that they would not go on tour until 2018. In March 2017, the band entered the studio to begin the recording process, with support from long time producer Tom Allom, along with former Sabbat guitarist and producer Andy Sneap and engineer Mike Exeter, who worked with the band on the previous album. This marked the first time since 1988's Ram It Down that they had worked with Allom. In an April 2017 interview with Planet Rock, Halford said that the band was "coming to some of the final moments" of completion of the new album. He also promised "a very exciting 2018 period" with a world tour taking place in 2018. In a post on Instagram in June 2017, Sneap said that the band completed tracking. In October 2017, Judas Priest, along with 18 other artists, were nominated for induction in the 2018 Rock and Roll Hall of Fame, but lost to Bon Jovi. They later announced their eighteenth album Firepower, which was released on 9 March 2018, with a world tour taking place thereafter, beginning in North America with Saxon and Black Star Riders as their support acts. The cover artwork was then unveiled along with a 15-second audio sample of the title track. On 12 February 2018, Glenn Tipton revealed that he had Parkinson's disease, with which he was first diagnosed in 2008, and would step down from touring. According to the band, the disease's progression left him unable to play the more challenging material. Tipton stated that he was still a member of the band despite his diagnosis and did not rule out future on-stage appearances. Sneap was then announced as his replacement for the tour. Faulkner later assured fans that Tipton would perform with the band "at some point in the tour." At the 20 March 2018 show in Newark, New Jersey, Tipton joined the band on stage to perform "Metal Gods", "Breaking the Law" and "Living After Midnight". He would continue to perform variously on tour as his health allowed. In April 2018, Judas Priest were announced as co-headliners with Deep Purple as they would tour North America in the fall of 2018. In September 2018, the band were announced as special guests for Ozzy Osbourne's final world tour as they would tour Europe for early 2019. They will also tour North America with Uriah Heep in the spring and summer of 2019. In a March 2019 interview with Australia's May the Rock Be With You, Halford stated that "there's definitely a new Priest album on the way." He was quoted as saying, "We're always looking for a different kind of tilt to what we're about as a band in the next project of songs we're going to release. We're already thinking about that now. We had a meeting in the U.K. just before we came to Australia about planning the foreseeable future." Judas Priest's style has always been rooted in heavy metal, and many of their albums reflect diverse aspects of the genre. For example, their first album, Rocka Rolla (1974), is primarily rooted in heavy blues rock. From Sad Wings of Destiny (1976) through Stained Class (1978), their style was somewhat progressive, with complex guitar passages and poetic lyrics. Songs would often shift in dynamics and tempo, and the music was some of the heaviest of its day. This would later have a major influence on progressive metal bands. 1977's Sin After Sin used a combination of double bass drum (or "double kick") and rapid 16th bass rhythms combined with rapid 16th guitar rhythms used by Black Sabbath, Venom, and Motörhead that came to define the genre. While the double-bass rhythms of Judas Priest are generally measured and technical, the song "Dissident Aggressor" (1977) pushed an increase in "tempo and aggression" which was later adopted by other bands with a much harder-edged approach. Starting with their fifth album, Killing Machine (1978), the band began to incorporate a more commercial, radio-friendly style to their music. British Steel has been referred to as the "record that, more than any other, codified what we mean by heavy metal". The lyrics and music were simplified, and this style prevailed up to their seventh album, Point of Entry (1981). With their eighth album, Screaming for Vengeance (1982), the band incorporated a balance of these two styles. This continued on Defenders of the Faith (1984). With the follow-up album, Turbo (1986), the band incorporated guitar synthesizers into its signature heavy metal sound. On 1988's Ram It Down the band retained some of the more commercial qualities of Turbo but also returned to some of the fast tempo heavy metal found on their earlier works. This fast-tempo style continued with 1990's Painkiller. Jugulator (1997) tried to incorporate some of the 1990s contemporary groove metal styles. Demolition (2001) has a more traditional heavy metal sound with nu metal elements. Following the return of Halford for Angel of Retribution and Nostradamus, the band returned to the style of its early albums. The band's popularity and status as one of the exemplary and influential heavy metal bands has earned them the nickname "Metal Gods" from their song of the same name. Judas Priest have influenced a great deal of metal music since the late 1970s. They were ranked by MTV as the second "Greatest Metal Band" of all time (after Black Sabbath), and VH1 named them the 78th greatest artist of all time in 2010. The band has sold over 45 million albums to date. They were nominated for induction into the Rock and Roll Hall of Fame in 2018, but were passed over despite placing among the top 5 fan-voted nominees. The band has sold over 50 million records so far, having 11 top 30 albums in the United Kingdom. In addition to the sound, Judas Priest is also known for being revolutionary in heavy metal fashion. In the band's early years, they dressed in hippie-style 1970s outfits, but as the decade drew to a close, the rise of punk rock made this look outdated, so the band began wearing simplified wardrobes on their 1978 tour. 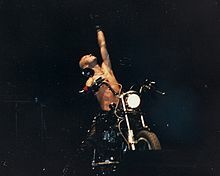 For the 1979 tour, Halford adopted his now-trademark leather-and-studs look, inspired by punk fashion and leather culture. The rest of the band adopted a similar style which became prominent at the time of their 1978 release, Killing Machine. This style would go on to be adopted by many heavy metal bands in the early 1980s, especially those of the NWOBHM and early Black Metal movements. To this day, it is not uncommon to find metal artists and fans sporting such a look at concerts. In a published quote on the back cover of K. K. Downing's autobiography Heavy Duty: Days and Nights in Judas Priest, Downing said that Judas Priest "had a bit of an identity crisis from the beginning. There was always a bit of a question mark about the band's look. To me, it never seemed to say anything — and in the earliest days of our career, I suppose I actually saw that as a good thing." Downing claims that he was the one who came up with the band's black-leather look back when he first started in the music business. He explains, "I had this Heavy Metal attitude inside of me. I had it all of my life. When I got into Judas Priest I knew I had a band that had a great name. I knew we were a great band...but something was not quite complete. The leather and studs image came along and it all started to complete itself. We had the album cover with the razor blade...and Heavy Metal was born, mate. I was a youngster and it came to me. Around 1976 is when it happened. The band took to it and got on with it, really." The American director Rob Reiner went to see Judas Priest in concert as part of his preparation for making the film This Is Spinal Tap (1984), which spoofs British heavy metal bands. The Judas Priest song "Electric Eye" was used in the temp score for Toy Story 3 (2010), but was ultimately replaced by another piece of music. On 5 January 2014, the band appeared in the episode "Steal This Episode" (which the name itself being a parody of the System of a Down album, Steal This Album!) of comedy cartoon show The Simpsons playing a parody of their song “Breaking the Law". Their music was referred to as "death metal", for which the producers subsequently apologised by having Bart Simpson write "Judas Priest is not 'Death Metal'" in the opening sequence chalkboard gag. Despite their huge, loyal fanbase, Judas Priest have never been well-received by much of the music press, partially because their late 1970s rise coincided with the punk rock and new wave movements, which occupied much of the music press's attention at the time. The first edition of The Rolling Stone Album Guide gave their first three albums one star each and described the band as "for lovers of stolen Led Zeppelin riffs only". The second edition of the guide a few years later also panned their entire discography. Village Voice critic Robert Christgau was notably disdainful of the band, refusing to outright review any of their albums and relegating them to his "Meltdown" list (referring to artists he did not consider to have any material worth listening to). In 2018, they were nominated for entrance into the Rock and Roll Hall of Fame, but failed to get in, a move the band was critical of. They were however inducted into the Hall of Heavy Metal History at the Wacken festival in August 2018. Founder/CEO Pat Gesualdo thanked them "for the decades of hard work and dedication to heavy metal, an art form they helped establish." The band then stated that their induction "also sends a great message of inclusion for the metal community around the world, and keeps us defending the metal faith together." ^ The gig was on 25 November 1969, and Led Zeppelin vocalist Robert Plant was in the audience. ^ The Iommi Management Agency changed its name to Tramp Entertainments in 1973. ^ Hill and Sue Halford were married from 1976 to 1984 and have a son together. ^ a b c Popoff 2007, p. 2. ^ Popoff 2007, pp. 2–3. ^ a b Popoff 2007, p. 3. ^ Popoff 2007, p. 4. ^ a b Popoff 2007, p. 5. ^ Popoff 2007, pp. 5–7. ^ a b Popoff 2007, p. 8. ^ a b Popoff 2007, p. 17. ^ "Judas Priest Info Pages – Rocka Rolla". Thexquorum.com. Retrieved 10 August 2014. ^ "Judas Priest Info Pages – Forging The Metal". Thexquorum.com. Retrieved 18 April 2014. ^ "Hotell Sentralt i Tønsberg – Quality Hotel Klubben". Nordicchoicehotels.no. Archived from the original on 15 July 2014. Retrieved 18 April 2014. ^ "Newspaper cutting : Lydsjokk pa Klubben". Kkdowning.net. Retrieved 19 April 2014. ^ "Judas Priest Behind The Music Remastered: Judas Priest". MTV. Retrieved 18 May 2014. ^ "Judas Priest Tour Statistics". Setlist.fm. Retrieved 10 January 2015. ^ "Judas Priest – Never Satisfied statistics". Setlist.fm. Retrieved 24 November 2015. ^ Popoff 2007, p. 34. ^ Popoff 2007, p. 32. ^ a b c Popoff 2007, p. 39. ^ Popoff 2007, pp. 39, 41. ^ a b Daniels 2007, p. 99. ^ Daniels 2007, p. 96. ^ a b Popoff 2007, p. 27. ^ a b Daniels 2007, p. 100. ^ Popoff 2007, p. 30. ^ Popoff 2007, p. 33. ^ Daniels 2007, p. 101. ^ Popoff 2007, p. 29. ^ Bowe 2009, p. 39. ^ Cope 2013, p. 110. ^ a b Popoff 2007, pp. 41–42. ^ Daniels 2007, p. 102. ^ Popoff 2007, p. 122. ^ Popoff 2007, p. 50. ^ Daniels, Neil (2007). The story of Judas priest: Defenders of the faith. Omnibus Press. ISBN 978-0-85712-239-1. ^ a b Daniel Bukszpan (2003). "The Encyclopedia of Heavy Metal". ^ "Unleashed in the East > Overview'". AllMusic. Retrieved 23 April 2007. ^ "Screaming for Vengeance Info Page". Judas Priest Info Pages. ^ "Defenders of the Faith Info Page". Judas Priest Info Pages. Archived from the original on 5 February 2007. ^ "Songs - RUNAROUND - BY STOCK / AITKEN / WATERMAN -©1988 Mike Stock Publishing Ltd / Matt Aitken Music Publishing / All Boys Music Ltd- Mike Stock Music". Mikestockmusic.com. Archived from the original on 26 November 2015. Retrieved 22 January 2018. ^ "Songs - I WILL RETURN - BY STOCK / AITKEN / WATERMAN -©1988 Mike Stock Publishing Ltd / Matt Aitken Music Publishing / All Boys Music Ltd- Mike Stock Music". Mikestockmusic.com. Archived from the original on 26 November 2015. Retrieved 22 January 2018. ^ "Judas Priest – Ram It Down". Kickedintheface.com. Archived from the original on 6 December 2009. Retrieved 10 August 2014. ^ "Q&A with Rob Halford > Overview'". The Gazette. Retrieved 22 August 2009. ^ a b c d Moore, Timothy (November – December 1996). "Scientific Consensus and Expert Testimony: Lessons from the Judas Priest Trial". Skeptical Inquirer. Retrieved 18 November 2006. ^ Cooper, Candy (1 July 2005). "The Judas Priest Trial: 15 Years Later". Blabbermouth.net. Archived from the original on 1 October 2007. Retrieved 18 November 2006. ^ "War of Words Info Page". Judas Priest Info Pages. Archived from the original on 5 February 2007. ^ "Rob Halford Discusses Sexuality Publicly for the First Time". MTV News. 5 February 1998. Retrieved 24 May 2010. ^ "Interview with Rob Halford of Two". NY Rock. Archived from the original on 7 September 2012. Retrieved 7 September 2012. ^ "Metal Hammer Award Winners Announced". Metalunderground.com. Retrieved 22 January 2018. ^ a b "Work on New Album Is 'Going Incredibly Well'". Blabbermouth.net. 12 September 2006. Archived from the original on 1 October 2007. Retrieved 18 November 2006. ^ Saulnier, Jason (16 April 2011). "Rob Halford Interview, Judas Priest Singer talks Rare Recordings". Music Legends. Retrieved 3 May 2013. ^ "Judas Priest Issues Warning About Ticket Prices". idiomag. 12 February 2009. Retrieved 13 February 2009. ^ "Message from Judas Priest after US Tour". Judaspriest.com. 24 August 2009. Retrieved 7 November 2010. ^ "Whitesnake tour announcement". Judaspriest.com. 13 August 2009. Retrieved 7 November 2010. ^ "Judas Priest Grammy Nomination for Dissident Aggressor". Judaspriest.com. 4 December 2009. Retrieved 7 November 2010. ^ Reesman, Bryan (4 June 2010). "Rob Halford: Back To The Future". Attention Deficit Delirium. Retrieved 29 June 2010. ^ "JUDAS PRIEST Announces Farewell 'Epitaph' Tour – Dec. 7, 2010". Blabbermouth.net. 7 December 2010. Retrieved 8 December 2010. ^ "ROB HALFORD Doesn't Want Fans To Be Sad About JUDAS PRIEST's Upcoming Farewell Tour". Blabbermouth.net. 11 January 2011. Retrieved 13 January 2011. ^ "JUDAS PRIEST Working on New Material – Jan. 27, 2011". Blabbermouth.net. 27 January 2011. Retrieved 28 January 2011. ^ "JUDAS PRIEST: More Video Footage Of Los Angeles Press Conference – May 25, 2011". Roadrunnerrecords.com. Archived from the original on 20 August 2011. Retrieved 3 October 2011. ^ "News – K.K. DOWNING retirement Press Release". JudasPriest.com. 20 April 2011. Retrieved 10 July 2011. ^ a b "JUDAS PRIEST Performs On 'American Idol' Finale; Video Available". Blabbermouth.net. 25 May 2011. Archived from the original on 29 May 2011. Retrieved 29 May 2011. ^ "JUDAS PRIEST To Release 'Single Cuts' In August". Blabbermouth.net. 7 June 2011. Archived from the original on 11 June 2011. Retrieved 11 June 2011. ^ "JUDAS PRIEST Singer Says '12 Or 14' Songs Have Been 'Completely Mapped Out' For Next Album". Blabbermouth.net. Archived from the original on 1 February 2013. Retrieved 5 September 2011. ^ "Judas Priest Hints at New Music for 2013". Billboard. 6 August 2012. ^ "Judas Priest Announce New Compilation Album – Lars Ulrich, Ozzy Osbourne, Alice Cooper and more chose their favorite Priest songs for 'The Chosen Few'". Rolling Stone. 13 September 2011. Retrieved 13 September 2011. ^ "JUDAS PRIEST's Rob Halford, Richie Faulkner Talk Epitaph, 40th Anniversary – "It's Not The End of Touring; We Are Still Going To Be Going Out There"". Bravewords.com. Retrieved 14 June 2013. ^ "Official Judas Priest news: Christmas message". JudasPriest.com. 22 December 2013. ^ "Rob Halford: New Judas Priest Album Is 'Finished' and 'F—ing Heavy'". Loudwire. 19 March 2014. Retrieved 19 March 2014. ^ "Judas Priest Unveil New Track from Upcoming Album". Tapp Out Music. Retrieved 18 May 2014. ^ Deriso, Nick. "ORIGINAL JUDAS PRIEST GUITARIST ERNIE CHATAWAY DIES OF CANCER". Townsquare Media. Retrieved 14 May 2014. ^ "Judas Priest Lands First Ever Top 10 Album in U.S. With 'Redeemer of Souls'". Blabbermouth.net. 16 July 2014. Retrieved 10 August 2014. ^ "JUDAS PRIEST TO ANNOUNCE TOUR DATES IN SUPPORT OF 'REDEEMER OF SOULS'". judaspriest.com. 20 May 2014. Retrieved 20 May 2014. ^ "Judas Priest announces 2014 Tour Dates, Barclays Center, Izod Center, Atlantic City, FFF Fest & more included". Brooklynvegan.com. 27 June 2014. Retrieved 10 July 2014. ^ "Judas Priest 2015 Redeemer of Souls Tour Schedule With Saxon". 11 January 2015. Archived from the original on 2 April 2015. Retrieved 29 March 2015. ^ Erickson, Anne. "Spotlight on: Judas Priest's Richie Faulkner". Reverb.com. Retrieved 18 November 2015. ^ Hartmann, Graham. "Judas Priest Are Back in the Studio". Loudwire. Retrieved 19 April 2016. ^ Huber, Nic. "Rob Halford Says New JUDAS PRIEST Will Arrive Early 2017". Metal Injection. Retrieved 5 April 2016. ^ Wardlaw, Matt. "Judas Priest's Rob Halford Is 'Hell Bent' for Rock 'n' Roll Fantasy Camp: Exclusive Interview". Ultimate Classic Rock. Retrieved 28 April 2016. ^ "JUDAS PRIEST To Begin Recording New Album In January; Next Tour To Start In 2018". Blabbermouth.net. Retrieved 2 November 2016. ^ "JUDAS PRIEST Taps Producers TOM ALLOM, ANDY SNEAP For New Album". Blabbermouth.net. Retrieved 13 March 2017. ^ "See First Photo Of JUDAS PRIEST And Production Team For New Studio Album". Blabbermouth.net. Retrieved 20 March 2017. ^ Childers, Chad. "Rob Halford: Judas Priest Reach 'Some of the Final Moments' of Recording New Album, Promise 'Very Exciting 2018 Period'". Loudwire. Retrieved 28 April 2017. ^ Divita, Joe. "Judas Priest 'Just About Done' Tracking 18th Studio Album". Loudwire. Retrieved 5 June 2017. ^ Aswad, Jem. "Rock and Roll Hall of Fame 2018 Nominees Include Radiohead, Judas Priest, Kate Bush". Variety. Retrieved 4 October 2017. ^ "BON JOVI Beats Out JUDAS PRIEST To Win 2018 ROCK AND ROLL HALL OF FAME Fan Vote". Blabbermouth.net. Retrieved 6 December 2017. ^ "JUDAS PRIEST To Release 'Firepower' Album; North American Tour Announced". Blabbermouth.net. Retrieved 23 October 2017. ^ "SAXON And BLACK STAR RIDERS To Support JUDAS PRIEST On 'Firepower' North American Tour". Blabbermouth.net. Retrieved 23 October 2017. ^ "JUDAS PRIEST: Listen To Audio Sample Of 'Firepower' Title Track". Blabbermouth.net. Retrieved 27 November 2017. ^ Snapes, Laura (12 February 2018). "Judas Priest's Glenn Tipton diagnosed with Parkinson's disease". Retrieved 12 February 2018. ^ "JUDAS PRIEST's RICHIE FAULKNER: 'We'll See GLENN TIPTON On Stage Again'". Blabbermouth.net. Retrieved 1 March 2018. ^ Lifton, Dave. "GLENN TIPTON JOINS JUDAS PRIEST ONSTAGE". Ultimate Classic Rock. Retrieved 20 March 2018. ^ "GLENN TIPTON On His Future Role With JUDAS PRIEST: 'It's A Question That I Can't Really Answer'". Blabbermouth.net. Retrieved 22 March 2018. ^ Jordan, Jerilyn. "Bassist Ian Hill on maintaining the firepower of Judas Priest". Detroit Metro Times. Retrieved 22 August 2018. ^ "DEEP PURPLE And JUDAS PRIEST Announce North American Co-Headline Tour". Blabbermouth.net. Retrieved 23 April 2018. ^ "OZZY OSBOURNE To Join Forces With JUDAS PRIEST For European Tour". Blabbermouth.net. Retrieved 3 September 2018. ^ "JUDAS PRIEST Announces 2019 North American Tour With URIAH HEEP". Blabbermouth.net. Retrieved 10 March 2019. ^ "ROB HALFORD: 'There's Definitely A New JUDAS PRIEST Album On The Way'". Blabbermouth.net. Retrieved 10 March 2019. ^ a b Andrew Laurence Cope. Black Sabbath and the Rise of Heavy Metal Music. Ashgate Publishing. ISBN 978-1-4094-9398-3. ^ Roy Wilkinson (20 May 2010). "How Judas Priest invented heavy metal". The Guardian. Retrieved 10 August 2014. ^ "Biography". AllMusic. Retrieved 13 February 2011. ^ Berelian, Essi. The Rough Guide to Heavy Metal. Rough Guides. p. 172. ISBN 1-84353-415-0. ^ a b Mastropolo, Frank (5 August 2014). "Four Decades of Hellfire with Judas Priest (Interview) – Rock Cellar Magazine". Rockcellarmagazine.com. Retrieved 22 January 2018. ^ Wilkinson, Roy (20 May 2010). "How Judas Priest invented heavy metal". The Guardian. Retrieved 22 January 2018. ^ "MTVNews.com: The Greatest Metal Bands Of All Time". MTV. 9 March 2006. Archived from the original on 5 September 2011. Retrieved 10 July 2011. ^ Riddle, Tree. "Original Singer: Judas Priest Would've Sounded 'More Like AC/DC' If I'd Stayed in Band". Loudwire. Retrieved 27 March 2012. ^ "Judas Priest Confirm UK Dates As Part of Epitaph World Tour". CaughtOffside. 28 February 2011. Retrieved 10 July 2011. ^ Glasgowvant (22 February 1999). "Glasgow SECC | Judas Priest Epitaph Tour 2011". Glasgowvant. Retrieved 10 July 2011. ^ Blabbermouth (13 December 2017). "BON JOVI To Join ROCK AND ROLL HALL OF FAME; JUDAS PRIEST Fails To Make The Cut". Blabbermouth. Retrieved 21 January 2018. ^ "Hell Bent for Leather/Killing Machine Info Page". Judas Priest Info Pages. Archived from the original on 2 July 2007. ^ "K.K. DOWNING: 'I Think JUDAS PRIEST Had A Bit Of An Identity Crisis From The Beginning'". Blabbermouth.net. Retrieved 16 July 2018. ^ Wright, Jeb. "K.K. Downing – Wild Nights & Lots of Words!". classicrockrevisited.com. ^ Reesman, Bryan (10 April 2010). "Judas Priest In 'Toy Story 3'? Almost". Attention Deficit Delirium. Retrieved 29 June 2010. ^ Beaumont-Thomas, Ben (14 January 2014). "The Simpsons apologise to Judas Priest for calling them 'death metal'". The Guardian. Retrieved 27 January 2014. ^ "JUDAS PRIEST's ROB HALFORD On ROCK AND ROLL HALL OF FAME: 'We Just Want To See Some More Metal In There'". 25 March 2018. ^ "Video: JUDAS PRIEST Inducted Into 'Hall Of Heavy Metal History' At Germany's WACKEN OPEN AIR Festival". Blabbermouth.net. Retrieved 6 August 2018. ^ "JUDAS PRIEST 'Knocked Out' By 'Metal Guru' Award At CLASSIC ROCK ROLL OF HONOUR". Blabbermouth.net. 8 October 2005. Retrieved 22 January 2018. ^ "Kerrang Awards 2007: The Winners". Digitalspy.com. 24 August 2007. Retrieved 22 January 2018. ^ "JUDAS PRIEST's ROB HALFORD: 'You Need Inspiration In Rock And Roll'". Blabbermouth.net. 12 June 2015. Retrieved 22 January 2018. ^ "German Metal Hammer Awards - Metal Anarchy". metalanarchy.com. ^ "BLACK SABBATH, SLIPKNOT, MOTÖRHEAD Honored At GOLDEN GODS AWARDS: Photos Available". Blabbermouth.net. 14 June 2005. Retrieved 22 January 2018. ^ "'Metal Hammer Golden Gods' Winners RevealedMetal Insider". Metalinsider.net. 14 June 2011. Retrieved 22 January 2018. ^ "Golden Gods 2018: Judas Priest, Code Orange, Maynard James Keenan amongst winners". ^ "Metal Storm Awards 2005 - Metal Storm". Metalstorm.net. Retrieved 16 April 2018. Huey, Steve. "Sad Wings of Destiny - Judas Priest | Songs, Reviews, Credits, Awards". AllMusic. Archived from the original on 26 November 2014. Retrieved 18 May 2014. Wang, K. S. (9 July 2008). "Celebrity Drive: Judas Priest Bassist Ian Hill mourns the demise of the British car industry". Truck Trend. Archived from the original on 20 January 2016. Retrieved 15 January 2018.